When Ryan Levesque decides he wants to do something, his determination, lazer focus and dogged persistance will get it done. In a glowing forward by Glen Livingstone PhD, one of Ryans first online marketing mentors, he describes this trait of Ryans down to a T. As one of Glens students, Ryan intensively studied the priciples of the Ask formula and became obsessed by it's effectiveness. Ryan has since refined and systemisesd this effective marketing strategy to develop a highly engaging and powerful marketing tool that can be applied to pretty much any business sector. 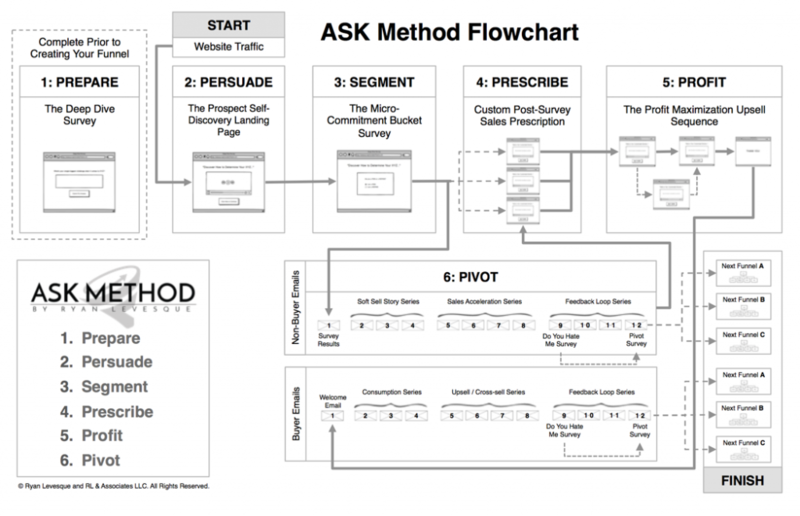 Part 1 which covers the “story” behind how the Ask Formula came into being. Part 2 which describes in detail, the methodology of it's implementation. 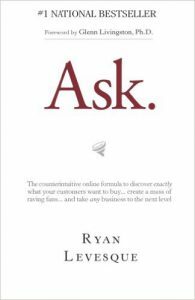 To open this section of the book, Ryan explains what the ASK formula is, who it is intended to help, and why we should seriously consider implementing it in our business models. Over the next few chapters, Ryan tells his emotional yet gripping story of his roller-coaster ride through collage, corporate America, on to China and back before ending up in hospital following a life threatening illness. In the process, Ryan describes his first forreys into online business and how it accidentally leads to the beginnings of the Ask Formula. So what is this formula? In essence, it is a completely automated system that will determine exactly what your potential customers want, segment them and transition them into appropriately targeted marketing funnels, all through the use of unique and carefully designed surveys and customer engagement. In this section of the book, Ryan takes us into the detail of each part of the system. For clarity I have included a diagram of the Ask Formula that appears in the book, to help you understand the principles of Ryan's system. Whilst the diagram shows each component and flow of the formula, the detail behind them is contained within the chapters of this section of the book. The first couple of chapters in this section of the book, provide a birds eye view of the formula as shown in the above diagram. Ryan then gives us an in depth description of how each survey within the Ask formula is handled, why it's constructed the way it is and most importantly – how to interpret the data acquired from each surevey. The information is very detailed with many examples of actual surveys and data obtained from Ryans own use of the Ask process. He also covers the subject of email followup series as used in the “Pivot” element of the system. Here he looks at what should be covered in the emails and in what order they should be sent, using clear examples to explain the rationale behind each message. Towards the end of the book, Ryan has included case studies covering two very different business sectors; “Tennis training” and “Water Ionizers“. The studies provide an interesting insight to the initial challenge for each business, how the Ask formula was implemented in each case, followed by the outcome achived by the business owners. The final couple of chapters cover why Ryan decided to write the book and where the reader can go to expand upon the information detailed in the previous chapters. Voted the #1 Marketing Book of 2015, “Ask” really does live up to expectations. I have read this book from cover to cover several times, and each time I find more nuggets of gold within it's pages. If you are considering starting a new online business, looking at breaking in to a new niche or would like to powerfully upgrade your exising marketing funnels, Ryan Levesque has provided all you need in this excellent book. I would highly recommend bying your own copy of this book, as I can guarantee you will be wanting to constantly dip in and out of it's pages as you endevor to extract every last gems of knowledge contained in it. Thank you so much for reading my review of Ryan Levesque's Ask and as always, I encourage you to leave a comment below. I'd be especially interested to know if you have any personal experience of using surveys in your business model, or indeed if you have implemented the Ask Formula that Ryan presents in this book.